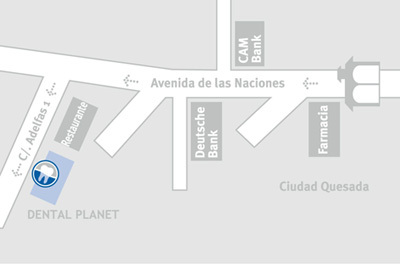 Here you can find directions to our dental practice Dental Planet in Quesada, coming from the airport. Starting at airport in Alicante, follow the blue signs with white writing to motorway A 7, direction MURCIA. Stay on A 7 for about 25 minutes. Then change onto the motorway AP 7 towards TORREVIEJA/CARTAGENA (exit Nr 724 on the AP7 Motorway). After about another 15 minutes you get to exit no.745: TORREVIEJA NORTE. Leave the motorway there and at the first round-about follow the TORREVIEJA sign to state road CV 905 (white sign with black writing). At the next round-about (with a lot of palm trees), drive towards CIUDAD QUESADA (again a white sign with black writing). Immediately after the round-about you will see a big arch. From this point onwards, please follow the map below.